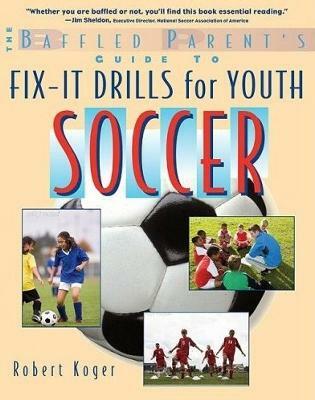 The Baffled Parent’s Guide to Fix-It Drills for Youth Soccer, and is for coaches to be able to find the problem their team is experiencing and then go to drills that correct the problem. This book is due to be released July 3, 2009. Coaches can go to the problem they are experiencing with their team and below the problem is the solution, which in most cases are a series of drills the team can do to eliminate the problem. It is a maintenance manual on soccer. I am the author and I also have 101 Great Youth Soccer Drills, and the new Coach's Guide to Coaching Youth Soccer. My book, 101 Great Youth Soccer Drills, is designed for coaches with players age 8 through 18. My book, The New Coaches Guide to Coaching Youth Soccer, is for coaches with players 4 through 8 years of age. All three books are listed on Amazon.com under coaching youth soccer and are almost always in the top 10. The web site in England, www.footy4kids.uk.com has picked the 101 Great Youth Soccer Drillls as one of their book selections. My personal web site is www.robertkoger.com and has more information on myself ad reviews of the books. I only uploaded the Baffled Parent's Guide cover. I have the others if you are interested.